AJ Styles technically turned heel this past week on RAW. I say technically because he ended up beating down John Cena within an inch of his life, and Cena isn't necessarily a huge face, but by traditional standards, it was a heel turn. Styles just finished a big main event feud with Roman Reigns for the WWE Title, but to be honest, though Styles may have looked good in the matches, he is lacking that huge victory to catapult him into true main event status. He's a big time player, and proved he could delight crowds in main event scenarios, stealing the show multiple times. So far, AJ Styles has feuded with Chris Jericho and Roman Reigns, and here we arrive at a huge heel turn to jumpstart a big feud with John Cena. Is the heel turn smart for AJ? Banding together with his brothers Gallows and Anderson is a great way to keep his momentum from shifting, but I do wonder if the Cena feud is a bit too soon. 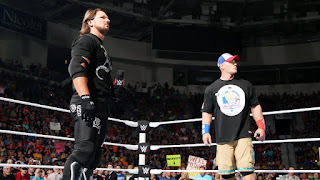 For the summer time, I'm not at all against an AJ Styles vs John Cena match at Summerslam, and I think this is what we will see, but for some reason, I feel like there were a few matches and feuds to do first before this, though Styles vs Cena being the beginning point for the heel turn truly could be the smartest decision in the long run, IF AJ wins the feud. -This is a feud for longevity, with different elements and such to be included, like maybe a main roster debut for American Alpha or The New Day assisting Cena to help deal with Gallows, Anderson, and presumably Balor as well. Let Styles get a win here, Cena can get a return win, then let Styles win a rubber match to move on to the next feud. -I'd make this feud for sure, with other Smackdown draft picks Cesaro and perhaps someone else who gets called up from NXT to help thwart off the Club. This would be a feud I'd make for either the IC title or the US Title, whichever one is the primary secondary title for Smackdown. I'd let AJ get done with Cena and feud with Sami, who would have won the secondary title. AJ and Sami go at it for 2 months, as they put on classic matches, perhaps starting with Night of Champions, then a final match at Hell In A Cell. I'd have them fight in the main event of Smackdown a few times as well, making this a short but sweet rivalry, with AJ winning the title from Zayn and beginning his first title reign in WWE. 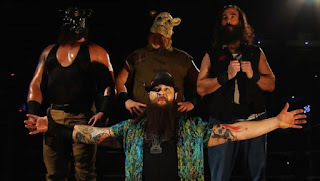 -With Bray Wyatt and his Wyatt Family as faces/tweeners and a big part of Smackdown, what better way to lead into Survivor Series than this huge feud? AJ, Finn, Gallows and Anderson takes on Bray, Harper, Rowan, and Braun in a 4 on 4 match, where Styles ends up getting the victory over Bray for his team. In a Smackdown main event of AJ vs Zayn the following week for the US Title, I'd have Bray's music interrupt and AJ get caught off guard to lose his belt back to Zayn and have war waged. I'd put AJ vs Bray in a tables match at TLC, or a street fight and let their feud spill over into the Rumble match, where AJ will have an encounter with the man he should face at Wrestlemania 33. -Orton should be drafted to Smackdown, along with Cena. Those two need to work with the newer stars and if anyone could go out there and give AJ a classic at Mania, it's certainly a motivated Orton. Orton is a legend in this business, one of the biggest names of the last 15 years, and he's done it all damn near at Mania. Let this build up begin with AJ getting eliminated from the Rumble by Orton and vowing revenge. I'd let Orton get a match against Finn on Smackdown, only to have it interrupted by AJ and go from there. The match could be given 17 minutes, see AJ gets his flying forearm turned into a desperation RKO, before finishing off Orton with a 2nd Styles Clash in their Mania match, giving Styles his first ever Mania victory. This is how I think you should book Styles as a heel going forward until Mania 33. I think these are all feuds we'd like to see and they keep AJ as a top heel on the Smackdown brand, which I suspect is where he will end up. Cena. Sami. Bray. Orton. Four of the best names in the business today, all of them going to war with AJ til Mania 33. Book it, WWE.